Draft: 2010, Tampa Bay Rays, 21st rd. Adam Joseph Liberatore (pronounced LIB-er-a-tour)...attended Blackhawk High School in Beaver Falls, PA, where he lettered in baseball and soccer...pitched three seasons of college ball at Tennessee Technological University, but underwent Tommy John surgery in 2009 after just three starts in his junior season...selected by Tampa Bay in the 21st round of the 2010 First-Year Player Draft. Appeared in four games with the Dodgers, allowing just one run over 3.1 innings (2.70 ERA) and held hitters to a .231 average...Began the season with Triple-A Oklahoma City and made 10 relief appearances, going 0-1 with a 2.31 ERA (3 ER/11.2 IP) and struck out 10 batters against just one walk...also made a combined two starts with Rookie-level AZL Dodgers and Single-A Rancho Cucamonga, tossing 2.0 scoreless innings of relief with three strikeouts against one walk...Made two different stints on the disabled list...placed on the 10-day DL with a left groin strain from May 9-25 for his first stint...placed on the 10-day DL with a left elbow strain on May 31 for his second stint, transferred to the 60-day on July 28 and missed the rest of the season. Tossed scoreless relief in 50 of 58 games, posting a 2-2 record with a 3.38 ERA (16 ER/42.2 IP)...limited opposing hitters to a .219 batting average, including a .171 mark (14-for-82) against lefties...Did not allow a run in 28 games from May 20 to July 22 (22.1 IP), establishing a Dodger franchise record for most consecutive scoreless appearances (previous was 23 by John Candelaria in 1991)...Prior to the All-Star break, he went 1-0 with a 0.61 ERA (2 ER/29.1 IP) and limited batters to a .153 average in 38 games, but struggled at the end of the season going 1-2 with a 9.45 ERA (14 ER/13.1 IP) in his last 20 appearances... In five combined games with Triple-A Oklahoma City and Single-A Rancho Cucamonga, he posted a 3.00 ERA and one save…struck out 10 against just two walks in 6.0 innings...Was placed on the 15-day DL August 3-19 with left elbow inflammation...underwent an arthroscopic left elbow debridement on Oct. 4. Saw his first big league action, going 2-2 with a 4.25 ERA in 39 games in three stints with the Dodgers. ... In the Majors, limited opposing hitters to a .232 batting average with a 1.18 WHIP…struck out 29 batters in 29.2 innings (8.80 strikeout per nine innings). ... Tossed scoreless relief in 30 of 39 appearances with Los Angeles. ... Made his Major League debut on April 17 against Colorado and struck out one in a 1-2-3 inning. ... Picked up his first big league win on May 25 against the Braves with a scoreless inning of relief. ... Was dominant in his first nine big league outings through May 11, allowing only one of 29 batters faced to reach base (a single) and striking out 10 in 9.2 scoreless innings. ... Opened the season with Triple-A Oklahoma City, going 0-1 with three saves and a 3.74 ERA in 19 relief appearances… limited opponents to a .237 batting average, including a .048 mark (1-for-21) against left-handers. Spent 43 games with Triple-A Durham and made one appearance with Double-A Montgomery to open the year…went 5-3 with a 3.58 ERA (60.1-IP, 24-ER) for Durham and 12 games finished…struck out 69 and walked 25…did not allow a run in 4 postseason appearances with the Bulls. Split the season between Double-A Montgomery and Triple-A Durham and combined to go 4-5 with a 2.47 ERA (73-IP, 20-ER) in 49 relief apps...started the season with Montgomery and recorded a career-high 8 saves...was transferred to Durham and pitched a scoreless inning on April 14 before rejoining Montgomery two days later...recorded 4 or more outs in 22 of his 33 apps for the Biscuits...promoted to Durham on June 22 and finished the season with the Bulls...13 of his 15 apps in his second Triple-A stint were scoreless. Spent the season with Class-A Charlotte and went 6-5 with a 3.09 ERA and 70 SO over a career-high 90.1 IP...recorded 4 or more outs in 31 of his 38 apps...in his first 6 apps of the season (April 8-27), allowed 11 runs (10 ER) over 14.1 IP (6.28 ERA)...after that, pitched to a 1.65 ERA (60-IP, 11-ER) with 50 SO over his next 23 outings...was 1-3 with a 5.63 ERA (16-IP, 10-ER) over his final 9 apps...went 2-0 with a 2.93 ERA (15.1-IP, 5-ER) and 15 SO in 10 apps with the Surprise Saguaros in the Arizona Fall League. Made his pro debut with Short-A Hudson Valley after being selected in the 21st round of the 2010 June Draft...allowed only 1 HR in 27.1 IP with 33 SO (10.87 SO/9 IP). September 5, 2018 Los Angeles Dodgers released LHP Adam Liberatore. August 31, 2018 Los Angeles Dodgers designated LHP Adam Liberatore for assignment. August 15, 2018 Oklahoma City Dodgers placed LHP Adam Liberatore on the 7-day disabled list. July 26, 2018 Oklahoma City Dodgers activated LHP Adam Liberatore from the 7-day disabled list. June 29, 2018 Oklahoma City Dodgers placed LHP Adam Liberatore on the 7-day disabled list retroactive to June 27, 2018. June 23, 2018 Los Angeles Dodgers optioned LHP Adam Liberatore to Oklahoma City Dodgers. June 8, 2018 Los Angeles Dodgers recalled Adam Liberatore from Oklahoma City Dodgers. 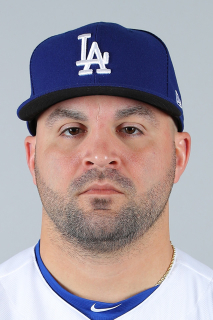 May 19, 2018 Los Angeles Dodgers optioned LHP Adam Liberatore to Oklahoma City Dodgers. April 18, 2018 Los Angeles Dodgers recalled Adam Liberatore from Oklahoma City Dodgers. March 20, 2018 Los Angeles Dodgers optioned LHP Adam Liberatore to Oklahoma City Dodgers. November 6, 2017 Adam Liberatore roster status changed by Los Angeles Dodgers. August 29, 2017 Los Angeles Dodgers sent LHP Adam Liberatore on a rehab assignment to Oklahoma City Dodgers. August 27, 2017 Los Angeles Dodgers sent LHP Adam Liberatore on a rehab assignment to Rancho Cucamonga Quakes. August 24, 2017 Los Angeles Dodgers sent LHP Adam Liberatore on a rehab assignment to AZL Dodgers. July 28, 2017 Los Angeles Dodgers transferred LHP Adam Liberatore from the 10-day disabled list to the 60-day disabled list. Left forearm tightness. June 1, 2017 Los Angeles Dodgers placed LHP Adam Liberatore on the 10-day disabled list retroactive to May 31, 2017. Left forearm tightness. May 25, 2017 Los Angeles Dodgers activated LHP Adam Liberatore from the 10-day disabled list. May 24, 2017 Los Angeles Dodgers sent LHP Adam Liberatore on a rehab assignment to Oklahoma City Dodgers. May 10, 2017 Los Angeles Dodgers placed LHP Adam Liberatore on the 10-day disabled list. Left groin strain. May 8, 2017 Los Angeles Dodgers recalled LHP Adam Liberatore from Oklahoma City Dodgers. April 27, 2017 Los Angeles Dodgers optioned LHP Adam Liberatore to Oklahoma City Dodgers. April 23, 2017 Los Angeles Dodgers recalled Adam Liberatore from Oklahoma City Dodgers. March 29, 2017 Los Angeles Dodgers optioned LHP Adam Liberatore to Oklahoma City Dodgers. October 23, 2016 Adam Liberatore roster status changed by Los Angeles Dodgers. October 7, 2016 Los Angeles Dodgers reassigned LHP Adam Liberatore to the minor leagues. August 19, 2016 Los Angeles Dodgers activated LHP Adam Liberatore from the 15-day disabled list. August 16, 2016 Los Angeles Dodgers sent LHP Adam Liberatore on a rehab assignment to Oklahoma City Dodgers. August 14, 2016 Los Angeles Dodgers sent LHP Adam Liberatore on a rehab assignment to Rancho Cucamonga Quakes. August 3, 2016 Los Angeles Dodgers placed LHP Adam Liberatore on the 15-day disabled list retroactive to July 30, 2016. Left elbow inflammation. April 14, 2016 Los Angeles Dodgers recalled LHP Adam Liberatore from Oklahoma City Dodgers. March 28, 2016 Los Angeles Dodgers optioned LHP Adam Liberatore to Oklahoma City Dodgers. October 16, 2015 Adam Liberatore roster status changed by Los Angeles Dodgers. October 9, 2015 Los Angeles Dodgers reassigned LHP Adam Liberatore to the minor leagues. September 22, 2015 Los Angeles Dodgers recalled LHP Adam Liberatore from Oklahoma City Dodgers. July 22, 2015 Los Angeles Dodgers optioned LHP Adam Liberatore to Oklahoma City Dodgers. April 27, 2015 Los Angeles Dodgers recalled Adam Liberatore from Oklahoma City Dodgers. April 22, 2015 Los Angeles Dodgers optioned LHP Adam Liberatore to Oklahoma City Dodgers. April 17, 2015 Los Angeles Dodgers recalled Adam Liberatore from Oklahoma City Dodgers. April 5, 2015 Los Angeles Dodgers optioned LHP Adam Liberatore to Oklahoma City Dodgers. November 20, 2014 Los Angeles Dodgers traded RHP Greg Harris and RHP Jose Dominguez to Tampa Bay Rays for LHP Adam Liberatore and RHP Joel Peralta. February 3, 2014 Adam Liberatore assigned to Tampa Bay Rays. October 18, 2013 LHP Adam Liberatore assigned to Estrellas de Oriente. April 8, 2013 LHP Adam Liberatore assigned to Durham Bulls from Montgomery Biscuits. January 10, 2013 Tampa Bay Rays invited non-roster LHP Adam Liberatore to spring training. July 22, 2012 Adam Liberatore assigned to Durham Bulls from Montgomery Biscuits. April 16, 2012 Adam Liberatore assigned to Montgomery Biscuits from Durham Bulls. April 14, 2012 Adam Liberatore assigned to Durham Bulls from Montgomery Biscuits. April 5, 2012 Adam Liberatore assigned to Montgomery Biscuits from Charlotte Stone Crabs. April 5, 2011 Adam Liberatore assigned to Charlotte Stone Crabs from Hudson Valley Renegades. June 18, 2010 Adam Liberatore assigned to Hudson Valley Renegades from Tampa Bay Rays. June 17, 2010 Tampa Bay Rays signed LHP Adam Liberatore.